Even though the readers know I am a tax guy, they often seek my investment advice. And I do have one suggestion for conservative investors: Look to that hated enemy, the Internal Revenue Code (IRC). There’s an old saying that goes, “You must know your enemy before you can defeat him,” and we are about to apply some rules found in the IRC that will delight those who are conservative investors. The typical goals of a conservative investor include increasing income while minimizing risk and lowering taxes. And, he wants to maximize inheritance to his family. Okay, let’s go to work. For tax purposes, there are two types of funds in which you can invest: qualified (in an IRA, profit-sharing, 401(k) or similar plan) or nonqualified (usually a personal bank account or funds you control in a business, trust, partnership or other entity). There are an endless variety of tax-advantaged strategies to accomplish the goals listed above. Here are the three strategies we use most often. Lenny the laborer is in a 25-percent income tax-bracket, not worried about estate taxes; Sam the supervisor is in a bit higher income-tax bracket but still without an estate-tax problem; and Joe is the business owner in a 35-percent income-tax bracket and 55-percent estate-tax bracket, using 2011 rates. All are 70 years old and in good health; Lenny and Sam are retired. Step 1—Purchase a lifetime income contract that pays a fixed annual amount every year for as long as you live. Divide the annual income into two parts, the first for income and the second to pay premiums on a life-insurance policy, to replace the cost of the income contract. The schedule that follows shows the results for Lenny (invested $250,000) and Joe (invested $2.5 million). Both were earning 2 percent on their funds before starting their HES. The numbers for Sam the supervisor would be similar. The numbers speak for themselves: More spendable income, more to family. For this example, everything is the same except the funds are in a qualified plan—in this case a rollover IRA earning 2 percent. The IRA funds are used to buy the income contract, a tax-free transaction at its inception. 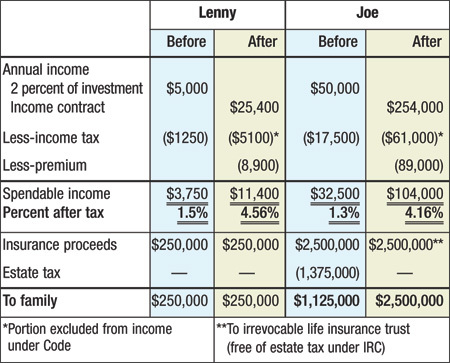 However, annual income (when received by Lenny and Joe) is subject to the full income-tax rate, the same as if a distribution had been made by the qualified plan. 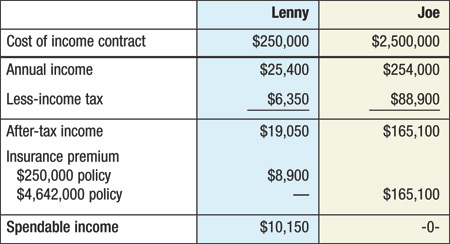 Lenny locked in $250,000 (at his death) for his family and will enjoy an annual income of $10,150 for life (4.06 percent after tax on the $250,000). Joe, on the other hand, does not need the income and chose to use all of his after-tax income to purchase life insurance for the extraordinary amount of $4,642,800—100-percent free from the estate tax. How much would Joe’s family have received if he got hit by the proverbial bus? Only about $750,000, because of the double tax—income and estate—on qualified plan money. So, the QPR strategy turned $750,000 of after-tax money into $4,642,800 (tax-free) for Joe’s family. The numbers look even better when Joe is married and the insurance involved is second-to-die. Want to increase your income, legally avoid the income tax on that income, and have your capital (plus all earnings) go to your family tax-free? No, it’s not a fantasy. It’s CILI, perfect for Joe, married to Mary (also age 70). Of course, the longer that Joe or Mary lives, the larger the amount to their heirs. The easy to summarize a CILI investment: You get your investment (premiums paid) back, dollar-for-dollar; plus earnings (3 percent here) on premiums paid; plus a guaranteed bonus, the death benefit (here $3 million); and, it’s all tax free (no income tax, no estate tax). Important note: The exact numbers for any specific person in each of the above examples are influenced primarily by age, healt, and interest rates.